Corn on the cob has a limited shelf life -- soon after harvest, the quality of the corn begins to deteriorate. To extend the availability of this seasonal treat, freeze the whole ears, making the juicy, sweet kernels available for eating for several months past season. The cobs can be frozen as is or blanched first. The freezing method depends on how long you intend to store the corn. Choose fresh ears of corn for storage. Freeze corn as soon as possible after harvest, as the kernels begin to lose juiciness and sweetness soon after harvest. Silk tassels that are not dark brown and dried out. Fresh corn will have sticky, moist silk. No mushy parts or visible discoloration on the kernel or husk. Well-filled out ears, with no wrinkles or loose, papery husks. Gently squeeze the corn, in the husk, to feel for firm, plump kernels. 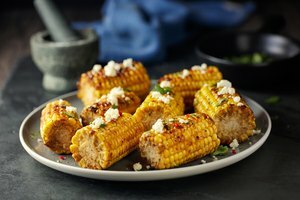 Corn on the cob does not need to be blanched prior to freezing. Blanching stops the enzymes in the corn, preventing the corn from ripening further. This improves the quality of the frozen corn. However, if the corn will be eaten within 1 or 2 months after freezing, the quality will not be greatly affected by not blanching. Remove the husk and silk from the corn. Bring a large pot of water, lightly salted, to a rolling boil over high heat. Drop the whole ears into the boiling water. Do not overfill the pot -- cook in batches if necessary. Boil the cobs for 9 to 11 minutes, depending on the size of the corn. Transfer the blanched corn to a large bowl of ice water and chill immediately. Wrap the cooled ears in plastic wrap, or place in airtight freezer bags and freeze immediately. Blanched corn will keep for 3 to 5 months before the quality begins to deteriorate. For unblanched corn on the cob, use the frozen ears within 1 to 2 months for optimal quality. Frozen corn on the cob, blanched or unblanched, can be cooked just like fresh corn on the cob. Boil the whole ears -- from frozen -- until thawed and cooked through, dressing with butter or olive oil, salt and dried or fresh spices. The ears can also be grilled from frozen, or roasted in the oven. 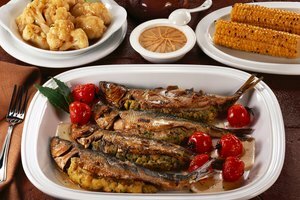 Wrap the ears in foil if the corn is husked before roasting or grilling, as the prolonged cooking time can lead to extra charring.